Contact us if you’re ready to discuss a dynamic PLM strategy. The transcript is close to a literal transcript of the spoken word. Please excuse any grammatical errors, spelling errors or break in the flow. The podcast is a non-scripted conversation with natural flow aimed to deliver value. The transcript is generated by a computer. Patrick: All right, welcome to the ArcherGrey Quick 30, everybody. Today, we have Jack Schroeder, who is the CEO and managing partner of ArcherGrey. Jack, thanks for joining us today. Jack: Thanks for having me, Patrick. Patrick: Yeah, I’ve been looking forward to this conversation for a long time. You know, today’s topic is going to be addressing the evolution of what we term PLM today. ArcherGrey has been in business for over 17 years, and so if you’re okay with that topic, I’d love to explore it with you. Jack: Sure, yeah. There’s a lot to cover. Patrick: Yeah, great. 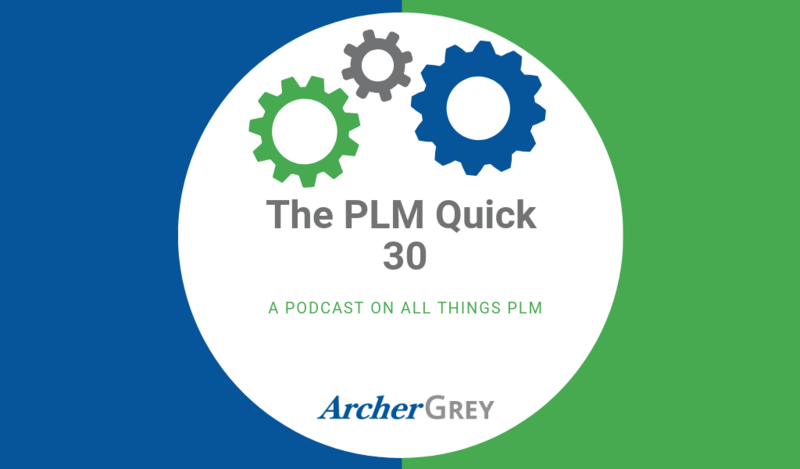 You know, just looking back to when you started ArcherGrey and what the pulse of the industry was like at that point, I mean, we’re talking about the topic of PLM, so rewinding back 17, 20 years ago, can you share your perception of what was happening in the industry at that specific moment? Jack: Sure, sure. Yeah, if you go back 20 years now, back in the ’90s, PLM, I don’t know if PLM the acronym even existed back then. PDM was coming about. Mostly what was happening was CAD management. It wasn’t even extensive, true product data management. It was really centered around managing the CAD data and models. Then, you know, it evolved in, say, the 2000s. It went from these mainframe-based systems like Sherpa or Metaphase to Matrix One and PTC’s Windchill or Agile’s solution in the late ’90s. That started, I think, opening the doors for PDM solutions to the general market. I think one of the barriers that existed in the ’90s was really the hardware and operating systems. There was mainframe systems and then the engineering department basically was constrained by their Unix operating system. Those were the two worlds. Then as the technology evolved, like I mentioned with Matrix One or Agile or Windchill, it became more Windows client-server based type solutions. PDM started opening up in the 2000s and it went from CAD management to, you could actually start managing bills and material, and with that change orders and change requests. The organization down from, say, the shop floor to back to engineering, they could communicate. It wasn’t a mainframe world in an engineering-based Unix network. It was like, now these two worlds came together with hardware and operating systems that enabled solutions like we’ve talked about to be deployed across the organization. They started managing true PDM type things. Patrick: How were people getting it done at the time? I mean, new CAD software was coming out. How it was being deployed and the supporting infrastructure was changing also. Patrick: How was it getting done? Jack: Once hardware and networks started changing, it opened the solution broader to the organization. In the 2000 time frame, it was the technology that we know of today, back then they were toolkits and the technology was being utilized by consulting companies that were building these solutions. Eventually, the software companies started building applications on their own toolkits to manage bills and material, to manage change requests, change order, you know, some of the fundamentals. That was an evolution that happened in the 2000s. Then it opened itself up to the broader market. I’d say from 2000 to 2010, there was a lot of new customer adoption. Companies were adopting PLM more and more. It went from like, the large aerospace and defense companies, automotive companies that were on these legacy mainframe-based systems to these more modern technologies of the 2000s that could span the organization. Applications were being developed and deployed, and the hardware and networks and operating systems caught up to the solutions and companies started adopting it more and more. I’d say, if you look back from 2000 to 2010, you know, it went from an emerging technology to a more mature technology, and then companies started adopting it more and more. That really is kind of that span of time. Then I’d say by 2010 time frame to now, you know, if you look at that next wave, knowing that we’re in 2019, I think largely, it all really comes down to industry, but largely in the discreet manufacturing side of things, most companies started, you know, like own some type of PLM solution. It went from PDM to PLM, which was a broader capability, not just CAD management, not just bill and material, change order type management, but more solutions managing projects and more capability throughout the organization. Then eventually, it started evolving into industry-specific solutions. That’s kind of how I think where we’re at today. We have industry-based solutions. It’s a mature market. Most large enterprise companies, those a billion-plus, have PLM in some form or another. I think maybe the small to midsize businesses are also adopting it. By industry, there’s still a great opportunity to leverage the technology, like, inside the retail space, apparel side of things, footwear, apparel, retail, so that’s another track to talk on. I think the technology is, all the systems have caught up to be able to support it. It’s a mature solution. Patrick: When you talk about, and by the way, thanks for going through that history, because I took the theme of emerging to mature, right, adopted, and so there’s the CAD aspect of that, there’s the PDM aspect, and then you transitioned into 2010 and beyond of talking about building applications specific to the toolkit, and now a mature model where there’s a base functionality and an offering that’s beyond just a toolkit, but a fully functioning, integrated software that’s mature. Patrick: Which, brings us into the stage of PLM. Patrick: I’m interested to hear where you feel the value was being recognized by the organizations in that same time period. You go from what you described the early 2000s to 2010, what value customers needed at that point. Then, the transition into 2010 as it was starting to be more established. Jack: Sure, okay. In the 2000 to 2010 time frame, because it was like, evolving from a toolkit to some applications, fundamental applications, core kind of capabilities, you know, all that fundamental communication, managing the creation, the design process, creating that data and managing the flow of that at its most fundamental level, bills, material, and change orders, that was a large impact to the business. You know, companies that were adopting it, there wasn’t really this industry focus. They largely relied upon outside capabilities from a technology perspective, and that’s what we experienced in the early 2000 time frame. We were technology providers, we were experts in the capability of the technology and how to deploy it. I wouldn’t say that we were industry experts, although we were really in the bleeding edge of deploying the technology into the apparel industry in the early 2000s. Through that, we largely relied upon our partnership with the customers that we were working with as subject matter experts and we were the technology leaders that enabled the deployment of the solution throughout the organization. Things started evolving, again, in that 2010 to now time frame where, the solutions from the software provider, they really had a lot of targeted capability and functionality to offer, and it really kind of evolved from, at least from a deployment perspective, you didn’t need to be this extreme technology expert, but you really did need to be more expertise in the industry needs. I think that’s kind of where we’re at today, where industry knowledge as it pertains to the specific business objectives and how technology helps enable the company to achieve their goals is where we’re at today. There’s a broad span of need within the businesses and it’s really navigating, trying to figure out how specific technologies like PLM could help them achieve their goals. Patrick: I’ll come back to this, but I do want to touch on it because I’m interested in your opinion. We’ve gone through this CAD PDM evolution to PLM, and then industry specific. I’m curious to hear your thoughts on PLM and this new terminology that’s being discussed around the digital thread. How do you boil that down? Patrick: Is it the same thing, or is it different? Jack: I’d say digital thread would fall under the umbrella of PLM. We used to say, “Get your house in order,” in order to be able to leverage the capability of PDM or PLM, and getting your house in order was the fundamentals. It’s like, yeah, it managed your CAD, managed the bills and material, managed the change orders. Then, you know, the technology expanded and if you bring it fast forward to today and the topic of the digital thread is out there, you still need the core PDM/PLM capability intact in order to go after a digital thread solution, and it does fall under the umbrella. Yeah, it’s product data, it’s product information, and it’s the digital thread, that information sits within the PLM solution, its origins. Patrick: I appreciate that explanation, and I’m just trying to structure this in my mind a little bit because it seems, well, I’ll put it in the form of a question. You’ve experienced at ArcherGrey this transition of having technology experts, customers, the value that was provided from 2000 to 2010, were technically being able to deploy the software so it worked and the customer could recognize the value of it. Now in 2010 and beyond, has there been a transition from implementing technology to customers struggling with coming up with a strategy of how to unleash the potential of the technology at this stage of the game? Jack: Yeah, so, yeah, I guess the answer would be, often you could see that struggle. What happens, you know, when you move from an emerging technology to a mature technology, often the mature technology becomes a legacy system within the organization. It’s a system that performs a set of functions that are critical to the business, but then, has the company, like, kept up with where technology has gone with PLM? Often, you could find companies struggling with, well, maybe not even struggling because the legacy part of the system’s working, it’s doing a certain thing and they really aren’t maximizing what they could be doing, leveraging technology to achieve their business goals. You know, recently, I’ll just speak from my own recent experience, we came to develop I think a groundbreaking solution, framework really, around analyzing in an existing customer’s business objectives, their business needs as it relates to PLM. We started out doing this, really, for companies that were trying to evaluate software, you know, one PLM solution over another, what their business needs were, and the struggle kind of sat inside of there. We weren’t sure which was the right fit, and so companies go through that software evaluation, assessment. Often, it’s a very artsy type of approach to a good consultant sitting down one on one with the company and trying to understand what their needs are, and then deriving the output from that. Where this breakthrough kind of came through around this framework, around process work and value assessment within the organization, it really is kind of a new approach to understanding, doesn’t matter if it’s a company that’s been using PLM for a decade or more, or one that really is brand new to it and hasn’t been using it, this framework really like, listens to the company functional areas across the organization, understanding what their issues are, their needs are, their objectives are, the pains that they are going through, and you start understanding a value score from a bottom-up approach and you ultimately can really assess where the company’s at in terms of their PLM maturity and in the return that they could see from deploying this technology in any form, initially or further downfield from where they’re at. The clarity, you know, going back to what you were talking about, is there struggles? I’d say there’s more of a lack of clarity in the market today in terms of the value of PLM, what does PLM mean, companies still have business objectives they’re trying to achieve, and whatever those technology solutions are, whether it’s an extension of PLM or extensions of ERP or supply chain solutions, it’s a network of technology solutions that kind of help them achieve their goals and they need clarity around how to apply technologies to solve those problems, that still exists. What I’d say really, is technology has evolved from emerging to mature. It’s still really, even with the best of technology solutions, it still comes down to people, the people within a business, what their goals are, their objectives are. It comes down to other people, outside people, inside people who understand how to achieve those goals, to leverage the technology to achieve those goals. That’s still very real. The people matter. Technology is really just a means to an end. Focusing on the business objectives and then leveraging technology to achieve them, that remains the same today. Patrick: I’m interested to dig a little bit deeper on what you were talking about, because you’re talking about the strategy, and I speak with a lot of companies out there, some considered more mature on their PLM implementation, but they’re all talking about how to develop a strategy and road map that aligns with outcomes that they’re trying to achieve as an enterprise. Patrick: Tell me more about how you’re helping them come up with a road map to align with their overall strategy as an organization. Jack: Sure, yeah. Just two days ago, I was sitting down with the folks from PTC on the retail side of their business, and we were talking about, really, the same topic. Often, you’ll find the word will come back, what they’re lacking is a road map. That’s a pretty common thing. Everybody needs a road map around how they’re going to deploy the technology now, into the future. Often, I think, in the past, kind of how that was achieved at a very high level is like, well, there’s these business objectives and people are trying to align the solution towards achieving that, but it’s at a pretty high level. I think what we’ve uncovered, and I really think it was an epiphany around this framework, because it’s really a knowledge dump of some of the top industry consultants who understand the PLM solutions, the capability and the functionality that exists within the PLM offering, it identifies all the business areas, functional areas throughout the business, and then really, through a structured framework and a methodology, working from the ground up, covering all these different areas of the business, scoring needs and challenges that they have from a business perspective of doing their job towards designing and building products, scoring it from the ground up approach and compiling all that data into a summarized view across the organization of where the most value could be derived by the business through technology. Patrick: Aside from sharing it with industry experts and software companies, has it been used in production, I mean, with clients? Jack: Yeah, yeah, yeah, definitely. There was a footwear company recently that we went through this assessment with. You know, I was blown away by the outcome and I think they were as well. I don’t think that they were ready to make the investment into PLM. They had preconceived notions throughout the organization, from an organizational change management perspective, that previous exposure or view of how technology could impact the way they do their business, their jobs, their daily functions. There was a lot of reluctance, hesitance to adopt it. Yet, there’s a true pain that was existing within the ground level of functional areas of their business, which kind of led to confusion, coming back to your question before around struggle, not really having clarity. But, by going through this assessment and applying this methodology, this framework and working from the ground up, it really exposed the need and the opportunity to impact the business to the point where, at the top level of the organization, the executive level, all the way to the C level, the value was exposed to the business and it enabled them to make the leap to invest into this solution knowing with confidence that the return was there, the value was there, and a true road map is laid out that ties directly back to functional need within the business to help them achieve their goals. The answer is, yes, we applied this framework and I think it took us maybe somewhere in the neighborhood of six to eight weeks to go through this full exercise. It can be done in a shorter period of time in a lighter form, but that six to eight week period just nailed this thing down and provided them the clarity that they were looking for and struggled with for years. Yeah, we’ve done it. Patrick: I think that’s awesome. I can tell you out of various conversations that I’ve had with various companies, they oftentimes struggle with creating the justification, a road map that’s going to align with objectives, and you just walked through a scenario where this assessment was leveraged where, if you compare the road map before we were engaged with them to once we were engaged with them, it changed the direction of what the priorities were because they saw the tangible results that could be achieved. Jack: Absolutely, absolutely Patrick, yeah. Patrick: That’s great, and we’ve been having similar conversations with other organizations that are ready to move forward with the framework as well because they see the value for it. I appreciate you sharing that. If anybody wants to learn more about the assessment, what’s the best way to reach out to folks at ArcherGrey? Jack: Yeah, well, definitely go to our website and all that contact information would be there. I think our typical approach really is, relationships matter, people matter, and let’s start with a conversation and really understanding what’s going on inside of their business. What we could ultimately do is go deeper on the conversation around the framework, the tool, what they’re looking to achieve, what their challenges may be. Yeah, we could have more detailed walkthroughs of the framework, the methodology, the knowledge base that really sits within this framework as well. Yeah, just go to the website, there’ll be points of contact on there. Patrick: Great. Www.archergrey.com, right. Jack, thanks so much for coming in. I’ve been looking forward to this conversation and I appreciate you sharing your insight and experiences throughout the years, and sounds like we’re looking forward to a tremendous future. Jack: Oh yeah, definitely. It was my pleasure, Patrick. I really enjoyed the conversation. Thank you.